If you are coming to the Smokies and need help planning what to visit we’ll help you! We know the best attractions in Gatlinburg and Pigeon Forge that are well worth a visit! It’s all family friendly and sure to leave you and your family or friends to be talking about your trip for years to come! 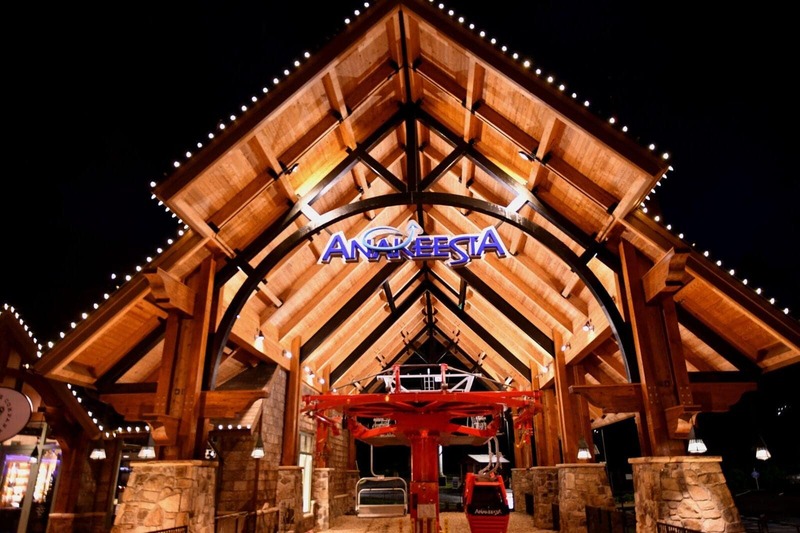 Anakeesta is an aerial adventure park in Gatlinburg. The only way to reach the summit of Anakeesta is by chair lift or gondola. Once you make it to the top you’ll find plenty of fun to have! You can race down dual ziplines, take a walk over 30 feet in the air at the tree canopy walk, or even just eat some good food! It won’t matter your age there is something for everyone to enjoy at Anakeesta whether it’s something exciting or relaxing. Dollywood is named after beloved country star, Dolly Parton. Like her, the park is a bright, welcoming place and full of Southern heritage. The park is home to over 30 rides and shows. From award winning rollercoasters, to bumper cars and gentle kid rides there is something for everyone! While you wander around the park you’ll come across lots of unique stores to shop in and tons of good smelling food! Make sure to try the cinnamon bread or the 25 pound apple pie while you are there! The infamous feud between the Hatfields and McCoys takes center stage in the Smokies! But with a hilarious twist to the story line! Come watch the two families play tricks on each other and laugh the night away. Moreover, you’ll be dining on delicious Southern cooking while watching the show. The Hatfield & McCoy Dinner Feud Show is one of our favorite must visit attractions in Gatlinburg and Pigeon Forge! The Ripley’s Aquarium of the Smokies is home to over 2,000 animals! Inside you can find sharks, sea turtles, penguins, and so much more! There are several exhibits that actually allow you to interact with animals and touch them too! Other exhibits throughout the aquarium are interactive and make learning fun! With 3 levels of things to see everyone in your group is sure to find something interesting and cool to see! The Island in Pigeon Forge is another one of our favorite attractions in Gatlinburg and Pigeon Forge to visit! Why? Because there’s so much to do! The Island is a large entertainment complex full of shopping, dining, and other attractions. Some of the most popular destinations to visit are the Smoky Mountain Wheel, Paula Deen’s Restaurant, The Escape Game, and more! The Old Mill Square offers shopping, dining, and is a great place to relax. It is a very popular place to visit in Pigeon Forge. You can watch metal workers practice their craft, you taste some moonshine, or dine on classic Southern food. The Old Mill restaurant is a must try here! And after you eat you can take a nice walk around Patriot Park which sits directly behind the Old Mill. The Great Smoky Mountains National Park is the most visited national park in the US. When you visit it, you’ll understand why. The Smokies have a wonderful sense of peace and wonder to them. The national park is free to enter, and offers days worth of fun to have. You can hike, bike, horseback ride, fish, and more! You can experience the Smoky Mountains in a truly unique way with CLIMB Works! You can zip your way past trees and soar over the forest floor when you try their ziplining tours. These tours offer you awesome views of the Smokies in a very safe and fun way. You can also give their mountain biking course a try too! The Country Tonite Show is one-of-a-kind. It’s fun for the whole family, and showcases some incredibly talented local singers, dancers, and musicians. You will enjoy a variety of dynamic singing and dancing, side-splitting comedy, powerful gospel, and American patriotism. Country music performed in the shows is from all eras, so everyone will find a song they enjoy. Cades Cove is part of the Great Smoky Mountains National Park. It is free to enter. Cades Cove is an 11 mile loop that you may travel by car, bike, or even horseback. Along the loop you will come across many historic structures like cabins, churches and a grist mill. You’ll also be treated to fantastic views of the Smoky Mountains and if you are lucky you may even see wildlife like deer and bears! There’s something for everyone to enjoy in the Smokies! Give this list of must visit attractions in Gatlinburg and Pigeon Forge a try and return to your comfy cabin with us at night! Explore our cabins and get ready to make the best memories with us in the Smokies!